Tim Stevens was studying English literature and working in a restaurant to make ends meet when he first became interested in wine. He subsequently met winemaker Matthew Loso at a tasting group in what would become a fateful meeting. He worked for two years as Loso’s assistant winemaker at Matthews (Loso has since moved on). 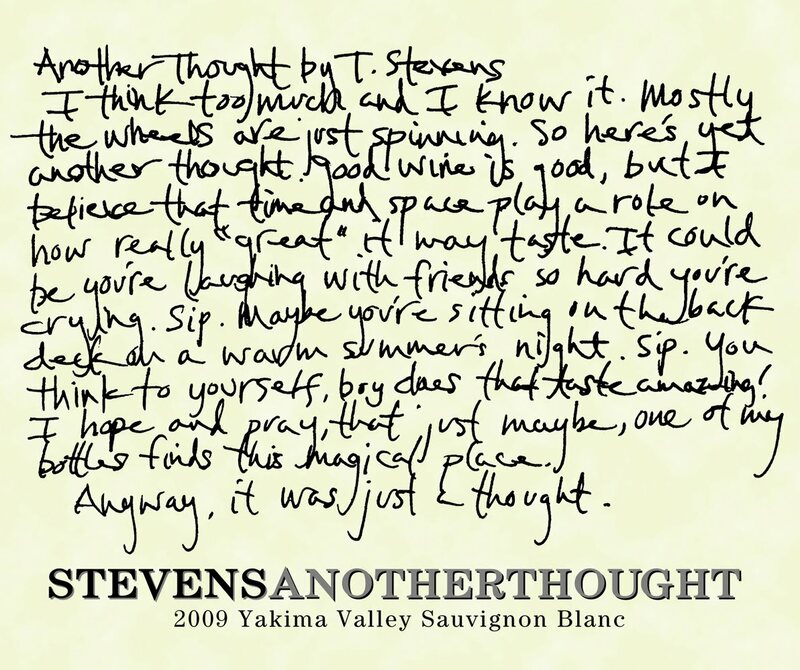 After a consulting stint with Scott Greer at Sheridan Vineyard, Stevens and his wife Paige started Stevens Winery in 2002. Stevens Winery has focused on small lot production of Cabernet, Merlot, Syrah, Malbec, Viognier, and Sauvignon Blanc. Formerly a commercial artist, each of the wines bear a unique label every vintage. 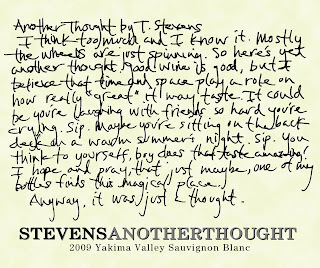 The 2009 Stevens Another Thought Sauvignon Blanc comes from Red Mountain’s Klipsun Vineyard. While this vineyard is best known for it’s powerful, tannic red wines, the 2009 Stevens wine shows that white wines can also excel there as well. The winery’s website gives a comical description of the wine stating, “White wine can be a monster to make and sometimes needs a lot of babysitting. We’ve done our share of watching this little devil and it’s paid off; this is our best Blanc yet.” Indeed this is an extremely compelling bottle with varietal aromatics of grass and herbal notes complemented by a palate loaded with fruit balanced by crisp acidity. This wine did indeed find such a magical place. It is an exceptional summer wine that screams out for seafood. I purchased this bottle from Full Pull Wines, which continues to excel with its hand picked e-mail offerings. Rating: * (Excellent) An intriguing nose with lime zest, grass, herbal notes, and mineral. Beautifully balanced and rounded on a palate full of crisp fruit flavors and a long, lingering finish. 100% Sauvignon Blanc. Klipsun Vineyard. Aged in stainless steel. 13.9% alcohol. 120 cases produced. Thanks for the call-out, Sean, and I'm glad you liked the wine as much as I did. This has been the summer of Sauvignon Blanc for me. After years of feeling underwhelmed by what the varietal does in Washington, this summer I have tasted three SBs that have been deeply exciting: Stevens, Efeste Feral, and Substance Sb. Bodes well. Paul, this one definitely knocked my socks off. One of the best whites I've had all year. Haven't tried the Sb yet. Will give it a look. Keep up the good work. Sean, you do great writeups that go hella in depth about the wines and wineries you experience. Unfortunately, looks like you took a day-off with this one. Stevens Winery is a short drive from CapHill (compared to Walla Walla) so I don't understand why you didn't at least visit the tasting room and try the lineup of wines like I recently did. I think some of your readers would be curious to know why their wines are ALL labeled "Yakima Valley"...even the Klipsun Vineyard sau blanc (Red Mtn) you purchased from the best store in the world for Washington wines. It's an interesting, though trivial, piece of info that adds to the character of the Stevens couple. WWM, case of inspiration to write about a wine after trying it one night and coming away very impressed. Everyone needs a day off! Haven't had a chance to visit Stevens since last December unfortunately. Have noted the YV labeling and would love to hear the story and try the whole lineup. Have always been impressive.